In my last articles I set the focus on the field of sensors in Biomimetics. Today I’d like to write about skin and its technological future. The skin is the main instance for a lot of creatures to create a border between them and their environment. However, a skin is not just about the definition of their own body against the different sources of danger from their surrounding. Very important is the preservation of information just from this area.Sound waves takes on the ear.The chemical composition of the environment can be detected by mouth and nose. The skin as a boundary of the body also has special perceptual sensors. Thus, the skin with its many receptors takes over tasks that are at least as important as seeing or hearing. My personal favorite is the skin’s ability to process light. The eyes can absorb „visible“ light and not more, our skin, however, can detect heat via radiation and also by conduction. The ability to sense the temperature of the environment should not be overestimated. In accordance with it, the sense of touch in combination with temperature perception, makes it possible to evaluate objects on consistency and condition. It makes a big difference if you feel a warm, liquid water or even cold, hard ice. Just this example can describe perceived sensations very well. Consider the response to cold ice in the hand and have warm water running down from the hand to the arm. If you were to perform the same experiment, for example, on the back, you would of course immediately feel the needle touches the back and you also know at what position. However, you could barely distinguish between 2 contact points at a distance of several millimeters. This leads to the realization that sensitivity has only indirectly to do with the resolution of touch. At least it seems that the resolution is at its greatest, where the most frequent interactions with the environment are performed. After a lengthy introduction today, based on own experiences, I would like to continue and transfer the phenomenon of the skin in the area of technology. In recent years, there are many projects that have specialized in the research of artificial skin. Starting with artificial skin for patients of surgery to very interesting ideas within robotics. As always, I will give a small overview about the topic. 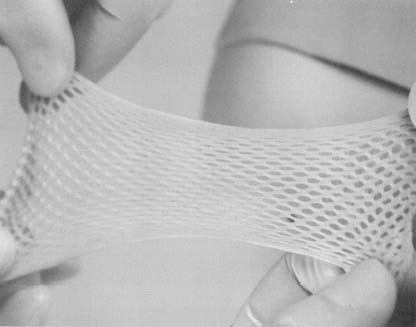 Another kind of synthetic skin was developed during the cooperation of Howard Green (Harvard University) and Eugene Bell (MIT) inside the Organogenesis project. The goal was to make an artificial skin that consists of an epidermis layer and has the ability to resist the patient rejection by the immune system. Graftskin is a living skin equivalent made of purified bovine collagen into which some cells of the patient are placed for growth (a technique that is mostly used today is in so called „tissue engineering“, which evolved out of these projects.) Cultured human skin cells are on top of the epidermis layer. In clinical trials Graftskins have not been rejected by patient’s immune systems. Another special field for this kind of electronic skins are embedded microchannels and liquid conductors. In August 2012 an article was published by Yong-Lae Park, Bor-Rong Chen and Robert J. Woods. 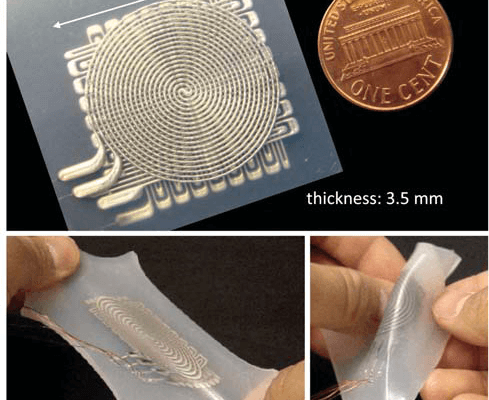 They described the design, fabrication and calibration of such artificial skin sensors. In general the sensor consists of diverse layers of microchannels, filled with conductive liquids, which led to very flexible electronic components! Here is another option for the usage of flexible electronics. Maybe it is a bit too far away from Biomimetics at all, but at least it is very interesting. 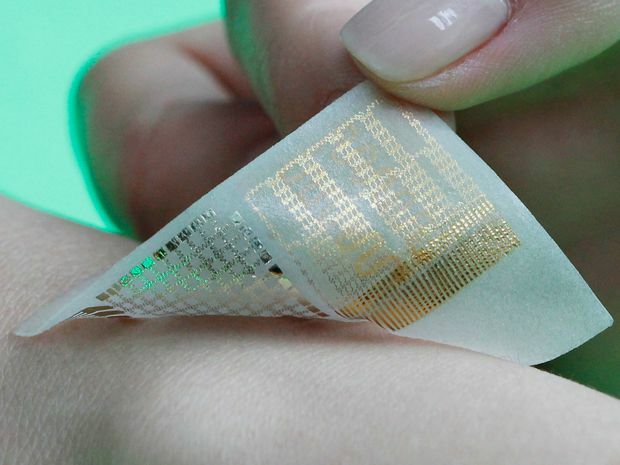 The researchers created a patch for the skin, that monitors muscle movement and stores the data. That should be enough for today. Maybe my next article will catch up the topic again and I show some other directions in the artificial organs field (maybe tissue engineering!?). 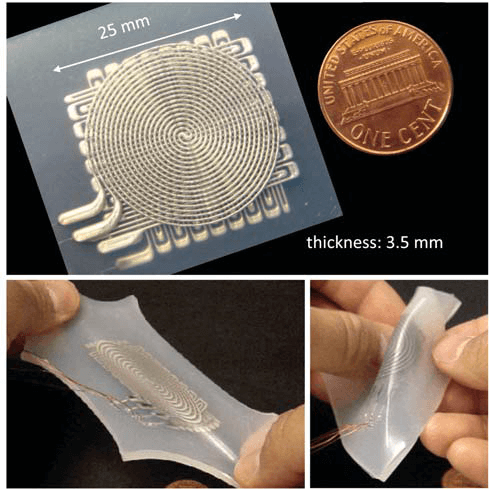 Design and Fabrication of Soft Artificial Skin … – Park et al.